Back in part one of this series, I talked about the three massive client-repelling mistakes I made when I was first starting out online with my copywriting business, and what I did to fix them. #1: I didn’t know who my ideal client/target audience was and what they struggled with, #2: I wasn’t expressing how I was different from others who offered a similar product or service, and #3: I wasn’t making an emotional connection with my ideal clients. (And you have to do the first two to be able to pull off the third). Last week in part two of the series, we talked about how to define your ideal client or customer, and why it’s so darned important to get this figured out if you want to have a successful business that attracts the “right” kind of clients and makes you money. Real or perceived benefit of a good or service that differentiates it from the competing brands and gives its buyer a logical reason to prefer it over other brands. USP is often a critical component of a promotional theme around which an advertising campaign is built. Finding your USP can be challenging, because chances are your products or services aren’t truly unique. Hardly anyone’s are, yet there are plenty of people online doing what you do, and what I do, who are wildly successful despite not offering truly unique products or services. That’s because they’ve positioned themselves well by determining their USP. And the good news is, once you figure out who your ideal client or customer is (see part two of this series on how to do that), figuring out your USP becomes much easier. What happens when you have a poorly defined USP? When someone searches online for that thing you do, if you sound just like everybody else, you’ll end up getting more than your fair share of price shoppers and other pains-in-the-you-know-where who will make you want to drive right off a bridge, instead of happy-making ideal clients who are willing to pay a premium for your specific creative expertise. 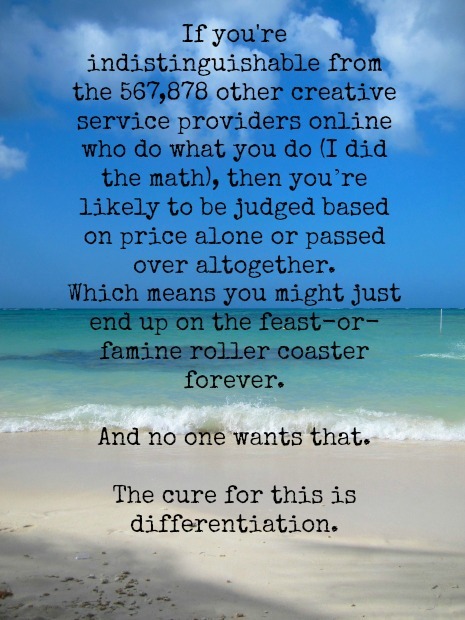 This happens because you’re indistinguishable from the hundreds of other creative service providers online who do what you do, so you’ll be judged based on price alone, or passed over altogether, which means you may just end up on the feast-or-famine roller coaster forever. And no one wants that. The cure for this is differentiation. Differentiating yourself in the online marketplace is absolutely essential to your success as a small creative business, because without it, you’ll be just another cog in the wheel of online commerce, a run-of-the-mill commodity whose services clients won’t place a premium on. If you’ve been providing creative services to clients for any length of time you’ve no doubt experienced this. I know I have. If you differentiate yourself effectively, you’ll begin to connect with and convert your ideal clients, instead of ending up with the ones who make you want to plunge daggers into your eyes. Because when a potential ideal client looking for a photographer, interior designer, graphic designer, personal stylist, or whatever kind of creative product or service you offer, lands on your website and sees it’s not like the hundreds of other sites out there they found when they were Googling that thing you do, they will stop and take notice, instead of trucking right on past your website never to return. Some obvious examples of effective differentiation and the hand-in-hand premium pricing that goes along with it are Apple, Harley Davidson, and designer Tory Burch, to name just three. You could buy a computer or a motorcycle or clothes much more cheaply from lots of other companies, but the cache attached to these three brands because of their position and differentiation in the marketplace makes their ideal customers insanely eager to pay premium prices for them. Hell, they even line up around city blocks for hours, just for the privilege of paying premium prices, in the case of Apple. What that means for you is, if you dig deep and figure out what makes you and the service you provide different and better and you convey that in everything you do across all the touchpoints of your business, you will attract clients who are happy to pay what you ask for your services, without the bargain-hunting drama. And, just as the defining your ideal client process is an iterative one, so too is determining your USP and applying it. You’ll refine as you get feedback and results, so don’t worry that you need to have every detail figured out before you begin implementing your points of differentiation into your business. The first thing I did was buy myself a little notebook and start brainstorming ideas. I made a list of all the possible categories I thought I could differentiate myself in, including the kind of clients I serve, my personality and unique skill set, the specific kinds of copywriting packages I offer, and so on, then looked at other copywriters online and saw how they presented themselves in each of these categories. I then methodically made notes from each category about what made me unique compared to my competitors. If it was too much of a stretch to find something unique about me or my business in a category, I scrapped it and moved on to the next category on the list. After that exercise, I read Now, Discover Your Strengths by Marcus Buckingham, and took the Strengths Finder Test to determine my 5 top strengths. This was amazingly helpful for getting a bead on the intersection of what I love to do and what I’m naturally gifted at doing. I then made a list of the relevant experiences and “stories” from my life that have some bearing on my business, such as my background in PR and Advertising, and getting accepted to art school (& not going), etc. The key here is to choose stories you’ll share with your audience that are relevant to your business. And something that was all kinds of uncomfortable, but totally worth it: I emailed 15-20 people – a mix of clients and friends – and asked them what they felt my 3 best qualities were. Almost everyone said some version of the same thing: sense of humor, easy to work with, and enthusiastic. There were a few other things I did, books I read, and questions I asked myself, but that’s the top-level overview of the process I used. Ok, so, what does effective differentiation look like, you may be wondering? If you’re anything like me, it always helps to see real world examples. I loved her on HGTV’s Design Star and I love her website. Emily Henderson does a great job of just being herself and injecting her personality throughout the site, from what she writes about, to how she writes it, to her design philosophy. Case in point: “perfection is boring, let’s get weird.” Love it! Google “wedding photographers” and let me know what you find. I’ll wait. See that? They all look pretty much identical – a whole lot of beautiful images, but no language or copy that makes an emotional connection with the potential client. Notice the difference on this site though – as soon as you land on the Home page, you’ll see that Natalie of Reminisce Photography is the wedding photographer for “the creatively courageous, effortlessly elegant, DIY, cupcake nibbling, detail-obsessed, romantically whimsical bride with a fun-loving edge.” She doesn’t do that ineffective thing many photographers online do – lead with beautiful images but no copy, which makes it hard for audiences to connect with the business. Very effective use of copy on this site to set Natalie and her services apart. Take 15 Minutes to Find Your Winning Difference, from the fine folks at Copyblogger. And 10 Examples of Killer Unique Selling Propositions on the Web, from the ever-so-awesome guys at Think Traffic. There you go. After reading this post and checking out the two creative differentiation examples above and the 2 extra articles I’ve linked up here, you should have some ideas about how to make your own business stand out in a crowded marketplace. So take action, and good luck! Kimberly on Can Copywriting Principles Work for Visual Artists?